The global rigid paper containers market was valued at around US$ 275 Bn in 2017. The rigid paper containers market is estimated to expand at a CAGR of 5.5% during the forecast period of 2018-2026. Rigid paper containers are paper-based packaging solutions that include boxes, trays, tubes, liquid cartons, and clamshells. Rigid paper containers can be manufactured using either paperboard or containerboard. Rigid paper containers made up of containerboard consist of two grades of board: linerboard and corrugating medium. Rigid paper containers made up of linerboard are used for creating the faces of the corrugated box while the corrugating medium makes up the rippled middle layer known as flutes. Material that is not corrugated, which includes cereal boxes, pharmaceutical cartons, and liquid cartons, among others, falls under the category of paperboard. Rigid paper containers offer easy printability and hence are considered ideal for printing product information as well as branding & marketing information. The rigid paper containers market is expected to have a positive outlook over the forecast period due to the rising importance of visually communicative packaging. The global rigid paper containers market has been segmented on the basis of board type, product type, and end-use industries. An extensive range of product options are available for rigid paper containers, which offer safe transit and storage along with consumer convenience for product handling. Rigid paper containers are preferred over other rigid packaging formats as they are lightweight, economical, and biodegradable. The rigid paper containers market has been segmented on the basis of product type as boxes, tubes, trays, clamshells, and liquid cartons. Rigid paper containers are available in a variety of shapes and sizes to cater to different end-use industries, which include food, beverages, chemicals & fertilizers, automotive, consumer goods, pharmaceuticals, etc. The rigid paper containers market offers immense growth opportunities to players in the rigid paper containers market owing to the booming retail & e-commerce sectors and an increase in the inclination of consumers toward sustainable packaging. Reusability & recyclability: Rigid paper containers are manufactured using wood pulp, which possesses high recyclability. Most rigid paper containers, including corrugated boxes, which are used globally, are made up of recycled pulp. Moreover, rigid paper containers are reusable, which makes them a preferred alternative over other packaging formats for home as well as commercial applications. Efficient storage alternative: Rigid paper containers, such as folding cartons, are used in homes as well as commercial applications for storing miscellaneous goods. Rigid paper containers are available in different sizes and shapes, which enables consumers to use them for the packaging of different types of products. When not in use, these rigid paper containers can be folded into a flat sheet and stored in very less space. Rising concerns over environmental issues: Consumers these days have made sustainability one of the decisive factors while choosing packaging formats. Owing to this, rigid paper containers are gaining traction among emerging as well as mature markets. Recently, Ecologic Brands Inc., a manufacturer of recycled packaging solutions, designed a paper bottle that can be recycled up to seven times. These rigid paper containers can be used for a number of applications such as the storage of wine, pet food, and more. The paperboard segment of the rigid paper containers market was valued at US$ 76 Bn in 2017 and is expected to expand at a CAGR of 6.1% during the forecast period of 2018-2026. On the basis of product type, the boxes segment holds the maximum market share in the rigid paper containers market and is expected to create an incremental $ opportunity of US$ 92,819.4 Mn during the forecast period. Among the end-use industries, the food segment is expected to maintain its dominance in the global rigid paper containers market by accounting about 26% of the total market share. The automotive industry is projected to expand at a CAGR of 6.5% during the forecast period. Some of the key players operating in the global rigid paper containers market include Sonoco Products Company, Smurfit Kappa, Mondi Group plc, Cascades Inc., Stora Enso Oyj, Huhtamaki Oyj, Oji Holdings Corporation, International Paper Company, DS Smith plc, and WestRock Company. In this report, Transparency Market Research offers an 8-year forecast of the global rigid paper containers market between 2018 and 2026. In terms of value, the global rigid paper containers market is expected to expand at a CAGR of 5.5% during the forecast period. 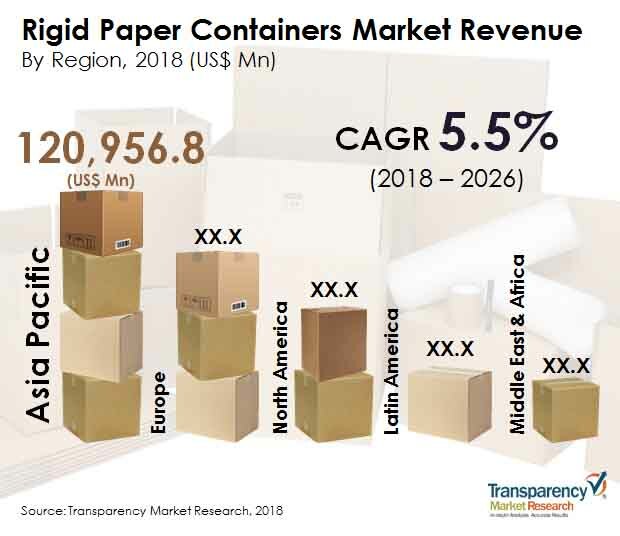 The study reveals the dynamics of the rigid paper containers market in five geographic segments, along with market analysis for the current market environment and future scenario over the forecast period of the global rigid paper containers market. This Transparency Market Research report studies the global rigid paper containers market for the period 2018–2026. The prime objective of this report is to offer insights and key market trends pertaining to the rigid paper containers market that are gradually helping transform global businesses. The global rigid paper containers market report begins with the executive summary for various categories, and their share in the rigid paper containers market. It is followed by market dynamics and overview of the global rigid paper containers market, which includes TMR analysis of the market drivers, restraints, opportunity analysis, and trends that are affecting the growth of the rigid paper containers market. Furthermore, to understand the popularity of the rigid paper containers segment, an attractiveness index and BPS analysis with elaborated insights on the same is provided, which will show the market’s attractiveness based on factors such as CAGR and incremental opportunity. To show the performance of rigid paper containers market in each country and region, BPS and Y-o-Y growth analysis is provided. The global market for rigid paper containers is further segmented as board type, product type, and end use. On the basis of board, the global market for rigid paper containers is segmented into paperboards and containerboards. On the basis of product type, global market for rigid paper containers is segmented into boxes, tubes, trays, liquid cartons, and clamshells. On the basis of end use, the global market for rigid paper containers is segmented into food, beverages, chemicals & fertilizers, pharmaceuticals, automotive, electrical & electronics, consumer goods, and others. The next section of the report highlights the rigid paper containers market by region, and provides the market outlook for 2018–2026. The study investigates Y-o-Y growth regionally, as well as analyses the drivers that influence the regional rigid paper containers market. The main regions assessed in this report include North America, Latin America, Europe, Asia Pacific, and Middle East & Africa (MEA). The report evaluates the present scenario and growth prospects of the regional rigid paper containers market for 2018–2026. To ascertain the size if the rigid paper containers market in terms of value and volume, revenue generated by key manufacturers and their respective production capacity are taken into consideration. The forecast presented here assesses the total revenue generated by value, across the rigid paper containers market. In order to provide an accurate forecast, we initiated by sizing up the current market, which forms the basis on how the rigid paper containers market is expected to develop in the future. Given the characteristics of the rigid paper containers market, we triangulated the outcome on the basis of three different types of analysis - based on supply side, downstream industry demand, and economic envelope. In addition, it is imperative to note that, in an ever-fluctuating global economy, we not only conduct forecasts in terms of CAGR, but also analyse the market based on key parameters, such as year-on-year (Y-o-Y) growth rates, to understand the predictability of the rigid paper containers market, and identify the right opportunities across the market. The market segments for the global rigid paper containers market have been analyzed in terms of basis point share (BPS) to understand the individual segment’s relative contribution to market growth. This detailed level of information is important for identifying various key trends in the rigid paper containers market. Another key feature of the global rigid paper containers market is the analysis of key segments in terms of absolute dollar opportunity. Absolute dollar opportunity is critical for evaluating the scope of opportunity that a provider can look to achieve, as well as to identify potential resources from a delivery perspective of the rigid paper containers market. The overall absolute dollar opportunity along with the segmental split is mentioned in global rigid paper containers market report. Transparency Market Research has developed the rigid paper containers 'Market Attractiveness Index'. The resulting index should help providers identify real market opportunities. In the final section of the rigid paper containers market report, a 'dashboard view' of the companies is provided to compare the current industrial scenario and their contribution to the total rigid paper containers market. Moreover, it is primarily designed to provide clients with an objective and detailed comparative assessment of key providers specific to a market segment. Report audiences can gain segment-specific manufacturer insights to identify and evaluate key competitors based on the in-depth assessment of their capabilities and success in the rigid paper containers marketplace.